Some seventy million years ago the Indian subcontinent, traveling northwards on the Ocean of Tethys, slammed into Asia in one of the greatest geological events in the Earth’s history. The immense stresses generated by the impact played out dramatically over the next fifty million years. The Indian and Asian tectonic plates folded and thrust up thousands of metres into the air to form the highest mountain chain on the surface of the planet: the Great Himalaya. Layers of sediment from the ocean floor travelled ahead of the folds rather like foam at the crest of a wave, and settled into convoluted masses of shorter mountain ranges and valleys on the northern flank of the Himalaya. One of these is the Zanskar. We are camped on a meadow by the Suru River. The looming ice-clad Himalayan peaks to our right tower over the rounded hills opposite, separated by this valley of almost ethereal beauty. It is a late August evening, and the sun sinking into the west suffuses the vista with a contrasting effulgence that is hard to describe. The 7000 metre Nun Kun massif soaks up the angled light and is aglow with a molten fire, while on the Zanskar slopes, the light is thrown back by the shale in iridescent streaks of ochre and silver. Two days later we are on the Zanskar River, floating on rafts past the ancient gompa (monastery) of Karsha perched impossibly on the steep mountainside. We are about to enter one of the most spectacular natural formations in Ladakh— the Zanskar valley gorge. The river itself is fed by the glacial melt of summer and flows swiftly at this time of the year, but by November it freezes into an ice-plate of ultramarine blue called the Chador, or blanket, and becomes virtually a road through this remote, isolated region. The next four days are a not just a journey of physical exploration along a rushing river, but a connecting of the spirit with the stark solitude that permeates this narrow valley whose sheer scale and verticality recall to mind – albeit on a reduced scale – the Grand Canyon itself. 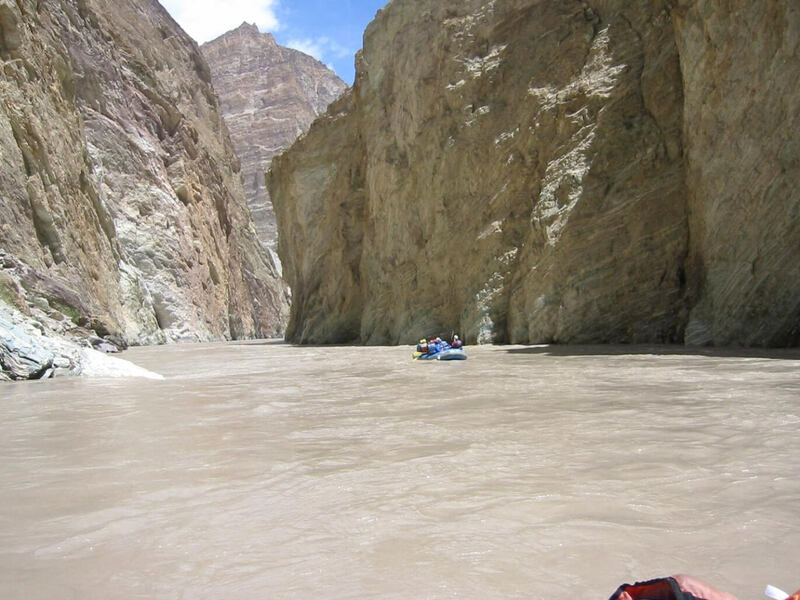 Compared to the greener slopes of the Suru, the Zanskar is all sand and rock. The river has eroded the mountainside into fantastical shapes. Giant anthill-like formations watch over the gorge like silent sentinels, and high above, serrated peaks slice into the azure sky. The barren grandeur silences us with its majesty as we float past, insignificant. In the midst of this harsh desolation, life not only endures, but is found in a myriad forms, adapted to the environment of a high-altitude desert. Janet Rizvi’s classic, Ladakh: Crossroads of High Asia, puts Ladakh as home to at least 225 bird species and mammals that are now mostly on the endangered list, including the Himalayan ibex and its variants such as the chiru, whose wool is used in the famous shahtoosh shawls. The third day finds us camped on a shelf of land overlooking the river. Our landlord (literally) is Tashi Dorjai of Nyerak village, who has seen an opportunity in the fact that winter treks on the Chador are fast becoming popular with the westerners. The winter here is incredibly harsh; the temperature drops to below 20˚ C with cutting winds. Why anyone would trek the Chador for fun in winter is beyond him (and us) but he will develop this flat patch into a regular ‘resort’ he says proudly. We sip our tea and listen to his story. Tashi was born in 1976, one of 7 children to an artisan family. Then, and indeed up to 1990, the Zanskar was almost completely isolated from the external world. Food grew between the months of May and September when the ice-fed streams permitted a short crop. Life was lived at the margin, with meals often limited to one a day. Yet, in a motif that still runs through the people of this land, what the Dorjais lacked in material possessions they made up in their closeness to one another and in their simple yet robust Buddhist faith. The first winds of change touched Nyerak village in the early 1980s when an NGO called the Leh Nutrition Project set up a makeshift primary school there. This was Tashi’s first experience of school—when he was 7 or 8 years old. Teaching was in Ladakhi, fitful at best, and went up to what was optimistically referred to as ‘5th Class’. But Tashi’s father was determined that his son go further. In 1988, he managed to get a seat for Tashi in the Jawahar Navodaya Vidyalaya (JNV) in Leh. Remarkably, 3 girls also secured admission to the same institution. More shocks awaited the little party in Leh. After having studied entirely in Ladakhi, they discovered that the JNV’s instruction was in Hindi and English. “We were back in kindergarten. Everything had to be learnt again.” The girls could not cope and soon went back. Tashi struggled till the eighth grade, but the effort ultimately got the better of him too and 1995 found him back in Nyerak. 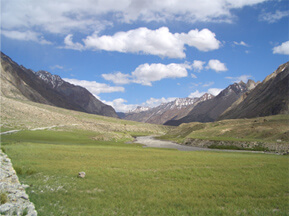 But the stint in Leh had changed him, made him aware of a wider world, and he was conscious of a sense of restlessness. One day, grazing his family goats in an upland pasture, it struck him like a thunderbolt. He would realize his unfulfilled dreams through his youngest brother. He would make Konchok Norbu everything he could not become. Tashi now went about systematically planning his brother’s future. The first move was to shift Norbu to the government school in Khaltse, around fifty miles from Nyerak. The school had acquired a reputation of sorts in the area for its two teachers, one a Muslim and the other a Hindu who were not only lifelong friends, but who lived together in the school and were known to encourage their wards to excel in every way. Young Norbu did so well under their tutelage that his Muslim teacher decided that the boy was meant for higher things, and had Norbu admitted to the high school in Jammu. The gentleman now became a steady presence in Norbu’s life, pushing the boy’s boundaries from a distance, and when Norbu graduated near the top of his class in Jammu, set him what appeared to be an almost impossible goal: the St Stephen’s College in Delhi. In 2005, Konchok Norbu entered St. Stephen’s to read Physics, arguably the first Zanskari villager in history to do so. Tashi moves on, showing us some rugs made by another of his brothers. He speaks with the assurance of a born salesman, and of course, I have bought one before I know it. Now…would l like to see some fine pieces of Ladakhi furniture which are unique…? I reflect on this school dropout who has seen so well into the future and invested in it, first in his talented brother and then in gora trekkers who have discovered the Zanskar. The sun is still well up in sky, but I am conscious of a sudden chill. What road? Tashi seems surprised. Didn’t we know about it? A road through the Zanskar has been a long-standing demand of the Zanskaris, but in the manner of the government nothing happened for decades. Then came the Kargil war, and the realization that the main routes connecting Srinagar and Manali to Leh were within the Pakistani and Chinese artillery range. The army needed a road through the interior. “What we Zanskaris could not get our sarkar to do in a lifetime, the Chinese and Pakistanis have managed it for us,” Tashi said drily. Back at camp we mention it to our guide, Yousuf Zaheer of Himalayan River Runners, who has been rafting the Zanskar for over 20 years. He nods sadly. “You’ll see it tomorrow.” Sure enough, we come upon it at noon the next day: a construction site blasted out of the gorge. The roaring of tippers and excavators and the plumes of dust that fly up in the air are a shock; as are the plastic bottles and wrappers that are strewn all long the river. Workers line the river bank and wave cheerfully as we paddle past. Now the road is with us for the rest of the way. Trucks and buses are a common sight and with them the inevitable dhabas. The sense of loss is almost overwhelming; we have left Shangri-la behind. Will this extraordinary place ever be the same once the tour operators come in a few years? Then I think of the Zanskaris, their faces seamed by hardship and I know the road offers them freedom from an isolation that I can only guess at. I think too of the intractable border politics between India, Pakistan and China and wonder what else is in store for this land. Running through my ruminations is a conviction that we will lose something unique if the Zanskar is not opened up responsibly, in a way that is sensitive to the needs of both its people and the environment. We do not lack for successful examples around the world. We have only to anchor them imaginatively in our unique local contexts. That is arguably our most urgent challenge. The river curves suddenly and before we know it, the Zanskar has merged with a broad sweep of water that is the Indus. We are at Nimu, close to Leh, and our journey is over. I look back a last time at the ridges receding behind me, at those “terrible, strange, sublime and beauteous shapes” and I know I will be back.